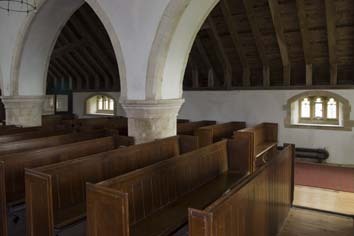 Aisles were added to an early C12 nave around 1200 and the chancel and clerestory are early C14. The tower is mid-C16. C19 alterations were complex. The present village comprises groups of houses south of the church and along the re-aligned A27. 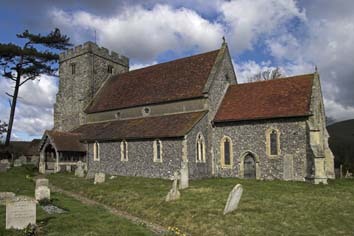 The church is near Glynde Reach, a navigable arm of the Ouse in the Middle Ages and probably marks the former centre of the village, which was a modest port. It was a minster church with a college of priests in the C9 (1 p140), though after the Conquest it was purely parochial and belonged to Wilmington priory. 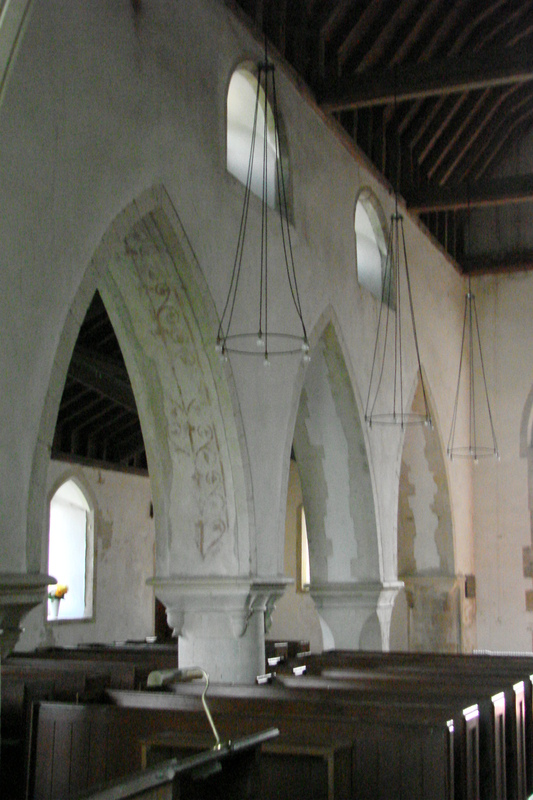 The nave is not older than the C12 and the high proportions result from the addition of a clerestory in the C14. A sizeable round-headed window, cut into by the western arch of the later north arcade, supports this dating. Though apparently all C14, the chancel is relatively short for that time and may retain its C12 proportions, possibly even some walling, as Hussey believed (Supplement p372). Godfrey suggests that it has been shortened (1 ibid), but there is no sign of this and the plinth is continuous. The arcades of c1200 differ from each other markedly, though each has three bays and pointed heads. To the north, the arches are tall and slightly chamfered, with short round piers and moulded abaci. The square responds are also chamfered. The south arcade has been substantially restored. 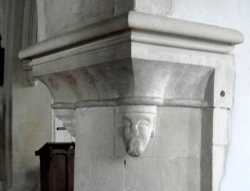 The heads of the arches are unchamfered and more steeply pointed and though all but one of the piers are round, the square capitals are of the so-called Ouse valley type (see Lewes, St Anne etc), with pendants in each angle. Only two now bear carved heads, though all probably did originally. The exception is the south west pier which is octagonal, changing to square at the top so there is no space for pendants. The west respond is cut away and a blocked plain pointed north doorway is contemporary. The church was remodelled in the mid-C14, including the east window of the chancel, partly old, which has curvilinear tracery and trefoil-headed side-lancets including a lowside and a south doorway. Possibly the chancel arch was replaced then, but the present one is C19 though in the right style; there is no record of any predecessor. About the same time, a clerestory was added to the nave. 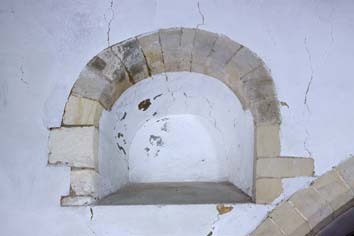 The openings in the form of ogee-cinquefoils, including one in the east gable, are mostly original, though the Sharpe Collection drawing (1803) shows one to have been replaced since. Only one tiebeam remains of the C14 roof. Probably in the later C14 both aisles were altered, as the three-light square-headed east window of the north aisle shows. The Sharpe drawing shows a square-headed window of two lights in the south aisle. The building of the west tower is well documented. Five wills, dated from 1540 to 1558/59 (SRS 41 p106), reveal first an intention to build and then the progress of construction. The material is flint and stone chequerwork, with much re-used stone. The start date suggests that Lewes priory, then being dismantled after the Dissolution, was the source. Less likely as a source is a previous tower on the site, for which there is no evidence. The present one is heavy and plain with diagonal buttresses. The plain mullioned bell-openings, renewed uncusped three-light west window and weathered four-centred doorway show the date, as do the battlements and tiled pyramid. The double-chamfered tower arch with semi-octagonal responds has an almost rounded head. The Sharpe Collection drawing (1803) shows the usual post-Reformation changes, including a south porch. The south aisle still stood, but had gone by 1827, when Horsfield states the arcade was blocked (I p340). It may have gone during repairs in 1810, for which J Goldsmith the younger submitted an estimate (ESRO Par 238/4/1/1). It is almost certain that W Slater rebuilt it in C14 style with a porch at the first restoration of 1857-58 (ICBS). However, it has also been given to W White‘s later restoration (Hunter p309, following Basil Clarke) (see below), but the ICBS records seldom err so the earlier date is preferable. The chancel followed in 1866 (KD 1874), including a new roof. No architect is recorded, but E Christian is known to have produced a plan of the church at an unspecified date (1 p2) so he may well have been involved. As architect to the Ecclesiastical Commissioners he often worked on chancels, for many of which the Commission was responsible and his involvement would be plausible. However, Gill Hunter (ibid) discerns the work of W White in the east window and other detail of the chancel. This raises problems since the date of 1866 is supplied by a reference of 1874, yet White is not known to have worked on the church until 1884, when he undertook a well attested further restoration of the nave. 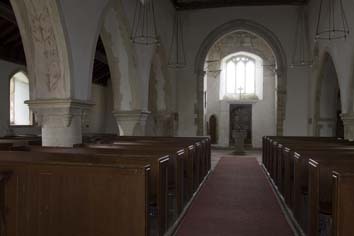 At best he may have made further improvements in the chancel since Gill Hunter attributes many of the fittings there to him. More certainly, he replaced most of the roof and opened up the clerestory (CDK 1884 pt 2 p174). 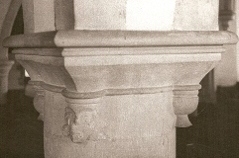 Slater had not restored the south arcade and only now were most pendants on the capitals replaced, though without heads. His work on this arcade may be responsible for the belief that White also rebuilt the aisle behind. He certainly worked on the north aisle, but it was not entirely rebuilt then as Harrison states (p25), for much of the exterior walling is visibly old, though the groupings of small trefoiled lancets are certainly C19 and could plausibly be by White. Some work was done on the tower in 1884, but by 1906 L W Ridge further renovated it at a cost of £150 (CDG 156 p174). The date of the chancel arch is unknown, but it most probably dates from the anonymous restoration of 1866. In 1931-32 W D Caröe and his partner H Passmore undertook repairs to the roofs and underpinned the north aisle (ICBS) and there were further general repairs by Carden and W E Godfrey in 1957-58 (ibid). Font: C14, but heavily restored. The plain square bowl has a chamfered underside and a cusped, arcaded stem. Monument: (North aisle, east end) Alexander Carr (d1790) by an unrecorded carver. This has a broken pediment, which was old fashioned by this date. The present position, almost touching the floor, is clearly not the original. 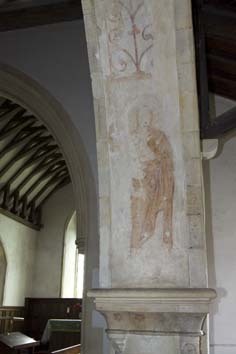 Paintings: (South east arch of nave arcade) On the capital are painted flowers and there is scrollwork and an unidentified female saint on the soffit. Probably C13. Piscina: (Chancel) C14 ogee-headed. The projecting rounded bowl appears to be a restoration. My thanks to Nick Wiseman for the photographs except those of the south west pier and east respond.